Take a glimpse into the current work of artists from The Bascom collection. Masters of tradition, West Virginia basketmakers Aaron Yakim and Cynthia Taylor make traditional Appalachian white oak baskets straight from the tree. The Bascom is an arts education center and tourist destination serving audiences in Western North Carolina and beyond with unique cultural experiences. Discover free-admission art exhibitions, plus skills-building studio art classes, curatorial talks and multiple-day festivals. Completed in 2009, The Bascom’s six-building, six-acre campus offers pastoral grounds, panoramic views of the Nantahala National Forest and spectacular architecture, such as an early 1800s covered bridge; vintage-wood pottery barn; and a main building constructed of barns, glass and steel. Amenities include a pet-friendly nature trail, seasonal Cafe and Shop, and limestone terrace for venue rentals. 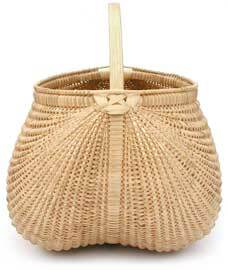 I just happened by your blog whilst doing a websearch on split wood basketry and what a happy find it is. 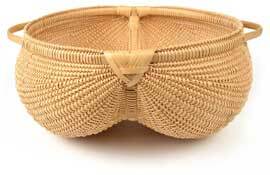 Split wood basketry is very rare in the UK only a couple of traditions. These baskets are very very beautiful. Now off to explore more of your older blog posts.